I just got back from a Bible study brunch with fourteen lovely "girls” my age, each of whom had contributed something to the potluck menu. Halfway through the meal, almost as if on cue, someone requested the recipe for whatever dish she thought was so terrific. And so it began. First we all oohed and ahhed in agreement that the [fill in the blank] really was the best [fill in the blank] we'd ever had, so we asked whoever brought the [fill in the blank] to please make copies of the recipe for all of us! Then somebody else complimented a second item, which led us to repeat the whole "ooh/ahh/make-us-all-a-copy” sequence. Truth be told, if everyone who was asked for a recipe actually followed through and provided copies, we'd have a sizeable enough collection to publish our own cookbook! And this was just one get-together! Multiply that exact same scenario by three, which is how many times we have brunch every year, times the number of years our group has been meeting, and we could amass enough recipes to fill a wing of the New York Public Library! Fortunately for all of us, nobody ever gets around to making a single copy. In fact, by the time the brunch is over we can't even remember what we made ourselves, much less what somebody else brought. Meanwhile though, as we were sitting around the table this week, collectively gushing over Melanie's sticky buns and Carole's garlic cheese grits (did I mention that these gatherings are notorious for derailing diets?) not surprisingly our conversation worked its way around from recipes in general to secret recipes, and our various encounters with them. Of course we're all familiar with Mrs. Field's cookie recipe, and how it came to be so widely available. (Supposedly a customer asked for the recipe and was told the price would be two-fifty. She interpreted that to be $2.50, but the actual amount billed to her credit card was $250! 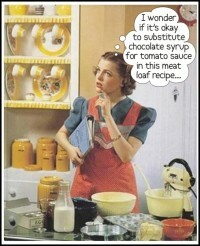 Outraged, she vowed to "get even” by making the recipe available to anyone, free of charge.) This same tale is also attributed to the Neiman Marcus cookie, and a similar version of the story even goes as far back as 1947 – only in this case it was a Red Velvet Fudge Cake from the Waldorf Astoria Hotel with an outrageous asking price of $25! All of these legends have been debunked, but remarkably they still live on. The experiences revealed in our group discussion, however, were anything but myth. One girl, for instance, said that in the small town where she grew up, the pastor's wife refused to give anyone her recipe for baked ham, and it turns out that the reason for all the secrecy was that she added (gasp!) a cup of rum to the glaze! That was thirty years ago and apparently the scandal still hasn't died down! A couple of the girls in our group said they'd heard of women who would share a recipe, but only after carefully omitting a key ingredient, or providing incorrect cooking instructions, in order to assure that nobody else's finished product would be quite as good. To us this tactic not only seemed a bit vicious, it can also backfire. I mean, think about it. If you realized you'd been deliberately sabotaged, wouldn't you be tempted to go ahead and take the awful, failed dish to your luncheon anyway, and make a point to let everybody know just exactly whose recipe it was? I sure would! Why would a person be so possessive over a silly little thing like a recipe? It just didn't make sense to any of us. So over dessert (and yes, you can serve dessert with brunch – or at least we do) we made a pact. From that point forward we vowed never to refuse a request for a recipe, even if it was one handed down from our great-great grandmother (or pilfered from the pastor's wife.) Of course, as usual we'll probably forget to follow through. Besides, it's not as if we're going to actually make any of those recipes anyway. After all, what makes a dish taste so wonderful is the fact that somebody else prepared it! Search for Cooking Class articles similar to "Secret Recipes. Search all articles similar to "Secret Recipes". List all Cooking Class articles.